Our good health is a marriage of our physical fitness and our emotional well-being. There is something funny about laughter (pun intended). We are all born with the ability to laugh, and it would seem, the need to laugh. Laughter can catch us off guard. If something strikes us as funny we cannot force ourselves not to laugh, even if we only crack a smile. We actively seek opportunities to laugh. There is a proliferation of comedy clubs across the globe, sitcoms account for more than 50% of the television programs we watch and there is a jokester in every crowd. Laughter is an international language, and even though not all humor translates equally across all languages, all human beings in the world find something funny. 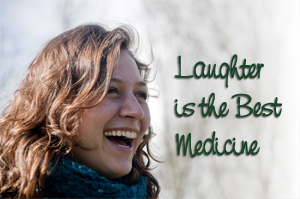 There is overwhelming medical research to confirm that laughter improves health. The health benefits of laughter are numerous. Laughter boosts the immune system. It increases levels of salivary antibodies which help to fight infections (especially respiratory infections). Lymphocytes (B cells which fight infection and T cells which attack viruses) which originate in our bone marrow are stimulated by laughter. Laughter cuts tension and can be very calming. Laughter lowers blood pressure and increases vascular flow. Laughter has been shown to reduce pain. The theory is because of the release of endorphins that accompanies a good laugh. Laughter eases fear and anger. Laughter can determine how we control our response to bad situations and can help us recover from the shock. Scientists believe that laughter allows human beings to connect. In the mid 90’s, recognizing the therapeutic benefits of laughter, Indian physician Dr. Madan Kataria, began laughter circles with like-minded individuals in a public park in Mumbai, India. They would stand in a circle in the corner of the park. People would take turns going into the center of the circle and telling a joke. The group would intentionally laugh out loud for 10-20 minutes. Unfortunately, after 15 days, all the good jokes ran out. Realizing that they benefited from the behavior of laughing, and they could do that without the jokes, Dr. Kataria continued with the group as Laughing Clubs. The group got together to laugh for 15-20 minutes in a series of very specific simulated laughters, such as cocktail laugh, hearty laugh, arm swinging laugh, and others. They performed each individual laughter for 30-45 seconds. In between each laugh, the group engaged in stretching, deep breathing, neck and shoulder exercises and the concept of Laughing Yoga was born. Laughing Clubs are now worldwide, and as of 2011, there are more than 8,000 Laughter Clubs in 65 countries. So when you hear someone say, laughter is the best medicine, they’re right! This article was posted in Home Health Care and tagged Healthcare Advice, Home Care, Senior Care.